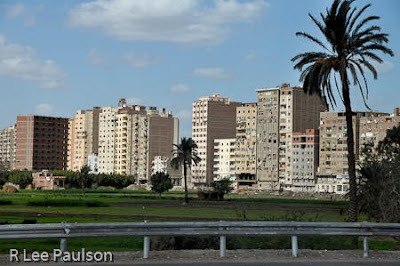 We left both Susan, above, and Suhaila behind in Cairo. 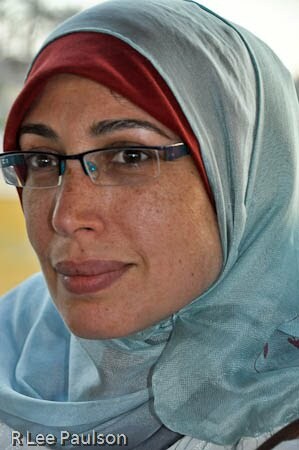 Each of them had bookings that made it better for them to stay in Cairo than travel with us. It was a true pleasure for me to get to know these two wonderful, but completely different Egyptian women. They were, as with many other aspects of Egyptian life, a complete study in contrasts. I always wondered before visiting Egypt what the houses looked like. So, here are a few images taken on our way to the airport to help you answer that question. As in any major large city, there are many different economic classes and styles of dwelling. These apartment buildings are more upscale than many we saw. 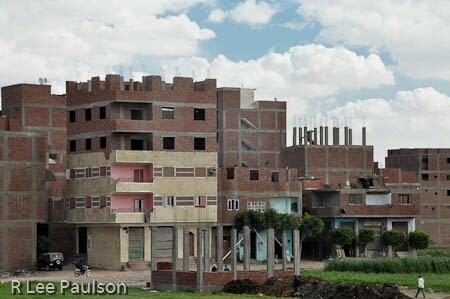 One thing that stood out for us, however, were all of the unfinished buildings. I began to wonder if they ever completed a building in Egypt. The basic answer to that question turned out to be no. They don't. The reason is that when a building is completed one must pay a much higher rate of tax on it. So, folks finish the inside of their buildings but leave the outsides looking like this. Actually, these are good. Most of them are a lot worse. Here, as in America, we see urban sprawl tearing into productive farm land. As in certain parts of our own country, this is a serious problem, here being addressed by the Egyptian government by planned developments out beyond the fertile area. 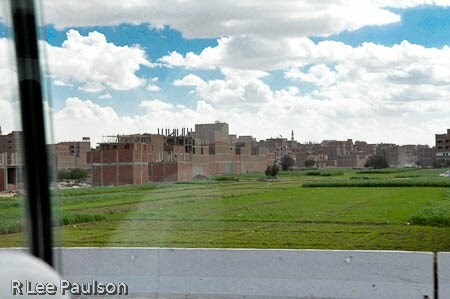 We flew over some of those developments on our way up to Luxor. Unfortunately, I didn't have a window seat so I could not photograph them. I'm not sure how successful their efforts will be in this regard. Who wants to live in a perpetual dirt bowl? 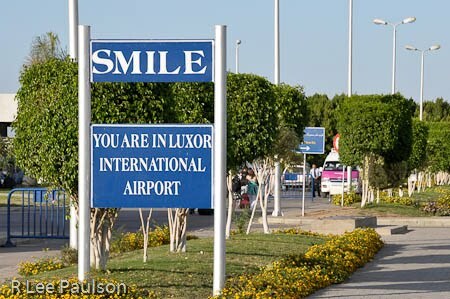 We all loved this sign at the Luxor airport when we arrived and I was encouraged to take a picture of it. I include it here because one can see in the background the blue barriers the Tourist Police have erected at the entrances to all the airports we visited. One can also see the pink tourist bus being stopped by the police as it attempts to enter the airport. The tourist police in Egypt keep careful track of all tourists going in to and out of the airports in their country. Behind the bus would typically find six or seven tourist police armed with automatic rifles and in many cases machine guns, guarding the entrance to the airport. The sun was going down as we boarded a small taxi boat that would take us to our lodging on the west bank of the Nile. In the background here, on the left, the pink awning, is a riverside restaurant. 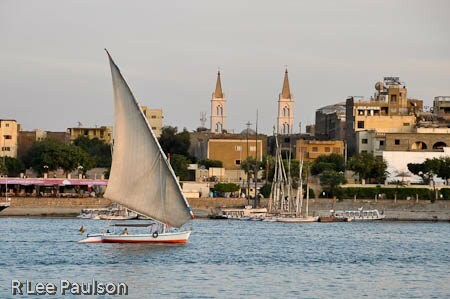 I loved these sailboats with their huge sails. They get a lot of mileage out of not very much wind. Though hard to see here, this is a similar taxi boat to that on which we were riding when the picture was taken. 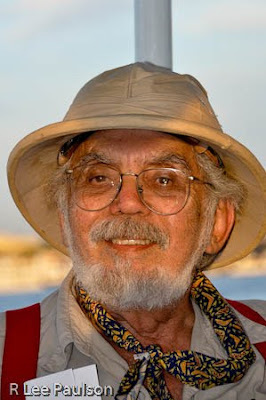 I am particularly fond of this photo of John Anthony West, our leader. 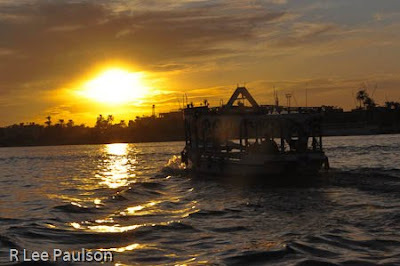 I took it with the setting sun shining on his face as we made our way across the river in the little taxi boat. Most of the time he was grumpy about having his picture taken. On this particular afternoon he seemed to enjoy the attention. Next time we'll visit the Temple at Luxor, in my mind a amazing, mind-boggling, architectural achievement. If ever there was any doubt about the sophistication of the ancients, this place should put that to rest. Unfortunately, many recognized scholars take the dimensions and proportionality found in this temple to be mere coincidence. Also, unfortunately, there is way too much evidence which would refute that position than I can possibly discuss in these posts. However, I can say with confidence that, as we have already seen, everything the ancients did when it came to architecture was done with the utmost intention. Absolutely nothing was done by chance or accident. Please keep that in mind in the following posts as I make an effort to give you just enough evidence to, hopefully, at least make you wonder. Continue on to Post 14: Luxor Temple by clicking here.